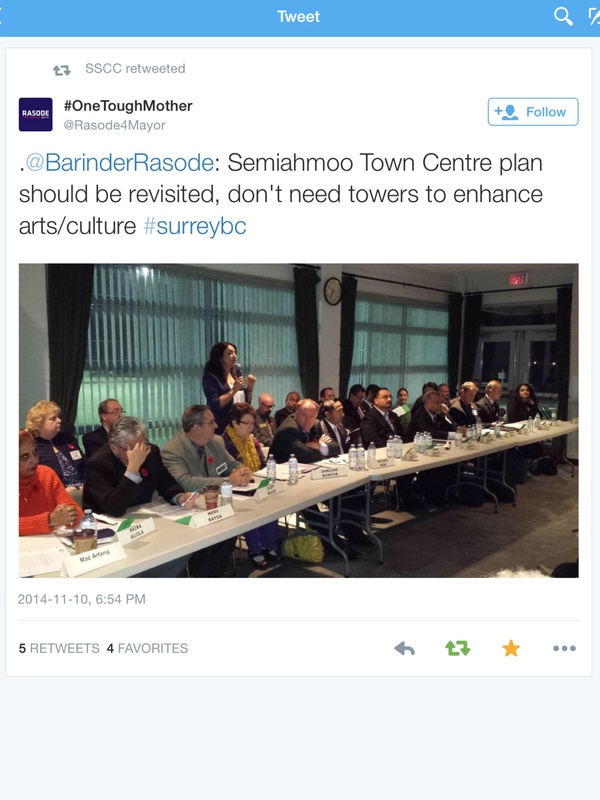 Semiahmoo Against Towers | Semiahmoo Residents wanting Sustainable Development, not more Towers. We want council to listen to residents, not just developers. Tell city council that our population cannot keep increasing without ensuring that our Hospital, highways, and schools can support it. Just say NO to more High Rise Towers and YES to more Arts and better shops and services! Semiahmoo Residents wanting Sustainable Development, not more Towers. We want council to listen to residents, not just developers. Tell city council that our population cannot keep increasing without ensuring that our Hospital, highways, and schools can support it. Just say NO to more High Rise Towers and YES to more Arts and better shops and services! Apartment sales are down, Buyers want single family homes! Survey to limit election spending…. Fed up with slates winning all the seats during an election? Think their endless budget has something to do with it? Feel like independents don’t get a fair shot? Fill out the survey and be part of the change! An interesting article about the “win” of Surrey First and true democracy. A Successful South Surrey All Candidates Meeting! A fantastic article and idea! Please read! Grassroots group turns heat up on candidates – Surrey Leader. We have heard over and over this year from all sorts of City of Surrey members…1000 new residents coming each month to Surrey. This is the excuse they give us for the development frenzy that is going on right now. How many are moving out of Surrey? How many are moving into rental accommodation? How many are extended family of residents who already live here and are moving into the same family home? If we take these questions into consideration does that magic 1000 number need adjusting? Does development need adjusting? Maybe this is simplifying it too much but when I think that we have 6 town centres (Fleetwood, City Centre, Guildford, Newton, Cloverdale and Semiahmoo) it seems like basic math. 1000 divided by 6 = 166.67 or for arguments sake 167. The Surrey City Development Corporation is currently involved in a proposed project in Semiahmoo to build 2 residential towers with 323 residential units. Surrey First has vehemently denied any conflict of interest in the city having dealings with SCDC. They continually tell us that SCDC is a separate entity. But watching the Mayoral debate on Shaw Linda Hepner states that SCDC pays the city a dividend each year. So how can members of council vote on any development proposal that SCDC is involved in without it being a huge conflict of interest? Other mayoral candidates are sure that SCDC is in debt. If it is, whose debt is it? We keep being told that these 323 units will be sold at “market value”. If you look at newer high rises down the street in White Rock the cost is up to $500,000. When looking on MLS for apartments up to $500,000 there are currently 157 two bedroom units for sale and 40 one bedroom units for sale. The newer developments have excess vacant units and are offering $10,000 discounts and limited time promotions. We still have many more developments that are in the building stages that haven’t even been listed yet on MLS. MLS for townhouses in the South Surrey area show 89 units for sale but keep in mind all the new townhouse development in the Grandview area that isn’t on MLS yet. Although White Rock is not part of South Surrey it’s only across 16th Avenue and many people in this area don’t really differentiate between the two cities so it is important to include their numbers too. White Rock currently has 126 two bedroom units for sale and 43 one bedroom units for sale. As with South Surrey the newer developments in White Rock are drastically slashing prices and developments in progress are not listed on MLS. Is it in SCDC’s best interest to build 323 more units in an area saturated with apartments and townhouses for sale? If they build it and no one buys it, who takes the losses? SCDC? City of Surrey? People of Surrey? Why is this project being pushed when there is obviously not a need for more units in the area and strong opposition from the community? We may never get a straight answer to any of these questions but the powers that be can be sure that this community will not give up. We are looking forward to reviewing the Semiahmoo Town Centre Plan next year and to have our input heard, acknowledged and implemented.